I have proofread for errors. 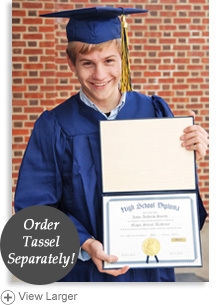 I understand a tassel must be ordered separately. Each Graduation Package contains a cap, gown and diploma. • Need the graduation package in a hurry? 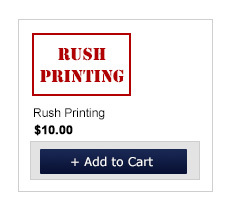 Click RUSH PRINTING tab above. second signature line removed and all pronouns will change to the singular. *If you need anything other than the name of your homeschool printed on this line please contact HSLDA. Give us a call at 540-338-8670 or email sales@hslda.org and we’d be glad to help you. NOTE: No refunds are given for Personalized Diplomas. We guarantee that each Personalized Diploma will be produced according to the information provided to us on the order form. If we have made an error, we will gladly reissue your order as soon as possible. However, we are not responsible for errors caused by incorrect information on the order form and will not provide a refund in such cases. If you place your order before 11:00 a.m. ET on any business day, you may make changes to your order up until 11:00 a.m. ET that business day. If you place your order after 11:00 a.m. ET on any business day, you may make changes to your order up until 11:00 a.m. of the next business day. From Marcia Anderson of Martinsville, Indiana on 3/19/2019 . From Angie of Pittsburg, Missouri on 2/20/2019 . From Kim Stanley of Santa Maria, California on 2/20/2019 . From Anonymous of Greenville, South Carolina on 10/17/2018 . From Lewis Drake of Keaau, Hawaii on 8/4/2018 . From Susann Weaver of Marion, Indiana on 6/7/2018 . From Anonymous of Chandler, Arizona on 5/31/2018 . 10/30/2014 – Is this diploma as real as a diploma issued by a high school?